Two severe power blackouts affected most of northern and eastern India on 30 and 31 July 2012. The 30 July 2012 blackout affected over 400 million people and was briefly the largest power outage in history by number of people affected, beating the January 2001 blackout in Northern India (230 million affected). The blackout on 31 July is the largest power outage in history. The outage affected more than 620 million people, about 9% of the world population, or half of India's population, spread across 22 states in Northern, Eastern, and Northeast India. An estimated 32 gigawatts of generating capacity was taken offline. An article in The Wall Street Journal stated that of the affected population, 320 million initially had power, while the rest lacked direct access. Electric service was restored in the affected locations between 31 July and 1 August 2012. India is the world's third largest producer and consumer of electricity after the United States and China; however, the electrical infrastructure is generally considered unreliable. The northern electrical grid had previously collapsed in 2001. In 2012, an estimated 27% of energy generated was lost in transmission or stolen, while peak supply fell short of demand by an average of 9%. During that period, the nation suffers from frequent power outages that last as long as 10 hours and about 25% of the population, about 300 million people, had no electricity at all. Efforts are underway to reduce transmission and distribution losses and increase production. In the summer of 2012, leading up to the failure, extreme heat had caused power use to reach record levels in New Delhi. Due to the late arrival of monsoons, agricultural areas in Punjab and Haryana drew increased power from the grid for running pumps irrigating paddy fields. The late monsoon also meant that hydropower plants were generating less than their usual production. At 02:35 IST (21:05 UTC on 29 July), circuit breakers on the 400 kV Bina-Gwalior line tripped. As this line fed into the Agra-Bareilly transmission section, breakers at the station also tripped, and power failures cascaded through the grid. All major power stations were shut down in the affected states, causing an estimated shortage of 32 GW. Officials described the failure as "the worst in a decade". On the day of the collapse, Power Minister Sushilkumar Shinde stated that the exact cause of the failure was unknown, but that at the time of the failure, electricity use was "above normal". He speculated that some states had attempted to draw more power than permitted due to the higher consumption. Spokesperson for PowerGrid Corporation of India Limited (PGCIL) and the Northern Regional Load Dispatch Centre (NRLDC) stated that Uttar Pradesh, Punjab and Haryana were the states responsible for the overdraw. PGCIL's chairman also stated that electrical service was restored "at a record time". A senior director for an Indian power company described the outage as "a fairly large breakdown that exposed major technical faults in India's grid system. Something went terribly wrong which caused the backup safety systems to fail." More than 300 million people, about 25% of India's population, were without power. Railways and some airports were shut down until 08:00. The busiest airport in South Asia, Delhi Airport, continued functioning because it switched to back-up power in 15 seconds. The outage caused "chaos" for Monday morning rush hour, as passenger trains were shut down and traffic signals were non-operational. Trains stalled for three to five hours. Several hospitals reported interruptions in health services, while others relied on back-up generators. Water treatment plants were shut down for several hours, and millions were unable to draw water from wells powered by electric pumps. The Associated Chambers of Commerce and Industry of India (ASSOCHAM) stated that the blackout had "severely impacted" businesses, leaving many unable to operate. Oil refineries in Panipat, Mathura and Bathinda continued operating because they have their own captive power stations within the refineries and do not depend on the grid. It took 15 hours to restore 80% of service. The system failed again at 13:02 IST (07:32 UTC), due to a relay problem near the Taj Mahal. As a result, power stations across the affected parts of India again went offline. NTPC Ltd. stopped 38% of its generation capacity. Over 600 million people (nearly half of India's population), in 22 out of 28 states in India, were without power. More than 300 intercity passenger trains and commuter lines were shut down as a result of the power outage. The worst affected zones in the wake of the power grid's collapse were Northern, North Central, East Central, and East Coast railway zones, with parts of Eastern, South Eastern and West Central railway zones. The Delhi Metro suspended service on all six lines, and had to evacuate passengers from trains that stopped mid-journey, helped by the Delhi Disaster Management Authority. About 200 miners were trapped underground in eastern India due to lifts failing, but officials later said they had all been rescued. The National Disaster Management Authority (NDMA), not normally mandated to investigate blackouts, began to do so because of the threat to basic infrastructure facilities like railways, metro rail system, lifts in multi-storey buildings, and movement of vehicular traffic. As of 2 August, Uttar Pradesh was being supplied about 7 GW power, while the demand was between 9 and 9.7 GW. Before the grid collapse, the private sector spent $29 billion to build their own independent power stations in order to provide reliable power to their factories. The five biggest consumers of electricity in India have private off-grid supplies. Indian companies have 35 GW of private off-grid generation capacity and plan to add another 33 GW to their off-grid capacity. Some villages that were not connected to the grid were not affected, such as Meerwada, Madhya Pradesh which had a 14 kW solar power station built by a United States-based firm for $125,000. On the day of the collapse, Power Minister Sushilkumar Shinde ordered a three-member panel to determine the reason for the failure and report on it in fifteen days. In response to criticism, he observed that India was not alone in suffering major power outages, as blackouts had also occurred in the United States and Brazil within the previous few years. The Washington Post described the failure as adding urgency to Indian Prime Minister Dr. Manmohan Singh's plan for a US$400 billion overhaul of India's power grid. His plan calls for a further 76 gigawatts of generation by 2017, produced in part by nuclear power. Rajiv Kumar, secretary general of the Federation of Indian Chambers of Commerce and Industry (FICCI) said, "One of the major reasons for the collapse of the power grid is the major gap between demand and supply. There is an urgent need to reform the power sector and bring about infrastructural improvements to meet the new challenges of the growing economy." On 1 August 2012, newly appointed Power Minister Veerappa Moily stated, "First thing is to stabilize the grid and it has to sustain. For that we will work out a proper strategy." He declined to blame specific states, saying, "I don't want to start with the blame game." Team Anna, the supporters of anti-corruption activist Anna Hazare, charged that this grid failure was a conspiracy to suppress the indefinite fast movement started on 25 July 2012 for the Jan Lokpal Bill and targeting Sharad Pawar. 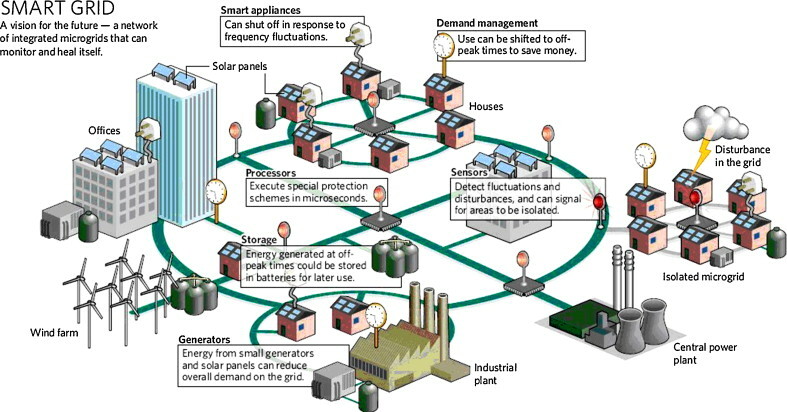 Some technology sources and United States Agency for International Development (USAID) proposed that another widespread outage could be prevented by integrated network of microgrids and distributed generation connected seamlessly with the main grid via a superior smart grid technology, which includes automated fault detection, islanding and self-healing of the network. Loss of 400 kV Bina–Gwalior link due to mis-operation of its protection system. The committee also offered a number of recommendations to prevent further failures, including an audit of the protection systems. ^ "Massive power cut hits India". BBC News. 2 January 2001. Retrieved 18 March 2015. ^ Helen Pidd (31 July 2012). "India blackouts leave 700 million without power". The Guardian. Retrieved 31 July 2012. ^ "India's Mass Power Failure Worst Ever in World History". Outlook. Press Trust of India. 1 August 2012. Archived from the original on 1 August 2012. Retrieved 1 August 2012. ^ a b "Power crisis now trips 22 states, 600 million people hit". Deccan Herald. 31 July 2012. Retrieved 31 July 2012. ^ a b c d e f g Sujay Mehuddia and Smriti Rak Ramachandaran (30 July 2012). "Worst outage cripples north India". The Hindu. Retrieved 30 July 2012. ^ Tripti Lahiri (1 August 2012). "How Many People Actually Lost Power?". The Wall Street Journal. Retrieved 5 August 2012. ^ "Power grids fail: Power restoration complete in Delhi & northeast, 50% in eastern region". The Economic Times. 31 July 2012. Retrieved 31 July 2012. ^ Gardiner Harris and Vikas Bajaj (1 August 2012). "As Power Is Restored in India, the 'Blame Game' Over Blackouts Heats Up". The New York Times. Retrieved 2 August 2012. ^ "How businesses pay for India's unreliable power system". SME Mentor. Associated Press. 2 August 2012. Retrieved 3 August 2012. ^ "Indian Businesses Weather Blackouts, but at a Cost". ABC News. Associated Press. 1 August 2012. Retrieved 3 August 2012. ^ a b c d Rajesh Kumar Singh and Rakteem Katakey (1 August 2012). "Worst India Outage Highlights 60 Years Of Missed Targets". Bloomberg. Retrieved 2 August 2012. ^ Express News Service (26 July 2013). "Address power transmission and distribution losses". ^ a b "Power grid failure: FAQs". Hindustan Times. 31 July 2012. Archived from the original on 30 July 2012. Retrieved 31 July 2012. ^ a b "Power grid failure makes 370M swelter in dark as India struggles to meet its vast energy needs". The Washington Post. Associated Press. 30 July 2012. Retrieved 31 July 2012. ^ a b Sruthi Gottipatti and Niharika Mandhana (30 July 2012). "Power Restored to Most of north India". The New York Times. Retrieved 30 July 2012. ^ a b c d Kartikay Mehrotra and Andrew MacAskill (31 July 2012). "Singh's $400 Billion Power Plan Gains Urgency as Grid Collapses". The Washington Post. Archived from the original on 5 August 2012. Retrieved 31 July 2012. ^ a b c "Power cut causes major disruption in northern India". BBC News. 30 July 2012. Retrieved 30 July 2012. ^ a b Rajesh Kumar Singh and Rakteem Katakey (3 August 2012). "Ambani, Tata 'Islands' Shrug Off Grid Collapse: Corporate India". Bloomberg. Retrieved 6 August 2012. ^ "When the lights went out". Hindustan Times. 31 July 2012. Archived from the original on 30 July 2012. Retrieved 31 July 2012. ^ Gardiner Harris and Heather Timmons (31 July 2012). "Half of India Crippled by Second Day of Power Failures". The New York Times. Retrieved 31 July 2012. ^ a b Kartikay Mehrotra and Rakteem Katakey (31 July 2012). "India Blacks Out From New Delhi to Kolkata as Grid Fails Again". Bloomberg. Retrieved 31 July 2012. ^ Saurabh Chaturvedi and Santanu Choudhury (31 July 2012). "India's Power Grid Collapses Again". The Wall Street Journal. Retrieved 31 July 2012. ^ "Multiple grid collapses hit train services again". First Post. Press Trust of India. 31 July 2012. Retrieved 31 July 2012. ^ "Hundreds of millions without power in India". BBC News. 31 July 2012. Retrieved 31 July 2012. ^ Vishwa Moham (31 July 2012). "Blackout expands NDMA's scope". The Times of India. Retrieved 31 July 2012. ^ "Power supply partially restored; Modi attacks PM". First Post. 31 July 2012. Retrieved 1 August 2012. ^ "India faces worst blackout as grids collapse hits 20 states, 60 crore people". IBN. 31 July 2012. Retrieved 31 July 2012. ^ "Northern power grid was again on verge of tripping". Hindustan Times. Indo-Asian News Service. 4 August 2012. Retrieved 5 August 2012. ^ "Madhya Pradesh: As power grids collapse, solar village shines". IBN. Reuters. 3 August 2012. Retrieved 6 August 2012. ^ "Greedy states send power grid crashing". Hindustan Times. 30 July 2012. Archived from the original on 31 July 2012. Retrieved 30 July 2012. ^ Simon Denyer and Rama Lakshmi (31 July 2012). "India blackout, on second day, leaves 600 million without power". The Washington Post. Retrieved 31 July 2012. ^ "Don't want to start with blame game: Veerappa Moily". IBN. 1 August 2012. Retrieved 30 July 2012. ^ "Team Anna calls grid failure a conspiracy, targets Pawar". IBN. 30 July 2012. Retrieved 2 August 2012. ^ "Team Anna sees conspiracy in northern power grid collapse". The Economic Times. Press Trust of India. 30 July 2012. Retrieved 2 August 2012. ^ "Power crisis and grid collapse: Is it time to think different, small and local?". SME Mentor. 3 August 2012. Retrieved 6 August 2012. ^ Kevin Bullis (31 July 2012). "How Power Outages in India May One Day Be Avoided". technologyreview.com. Retrieved 9 August 2012. ^ "The smart grid vision for India's power sector" (PDF). USAID India. March 2010. Archived from the original (PDF) on 16 June 2012. Retrieved 9 August 2012. ^ "Enabling integrated network of microgrids and distributed power connected to the grid via Smart Grid technology with [self-healing]". Retrieved 9 August 2012. ^ "Report of the Enquiry Committee on Grid Disturbance in Northern Region on 30th July 2012 and in Northern, Eastern & North-Eastern Region on 31st July 2012" (PDF). powermin.nic.in. 16 August 2012. Retrieved 28 August 2012.